ENR New England recognized the winners of its 2017 Best Projects competition - J.H. Maxymillian, Inc.
ENR New England recognized the winners of its 2017 Best Projects competition, honoring the top projects in Connecticut, Maine, Massachusetts, New Hampshire, Rhode Island and Vermont. 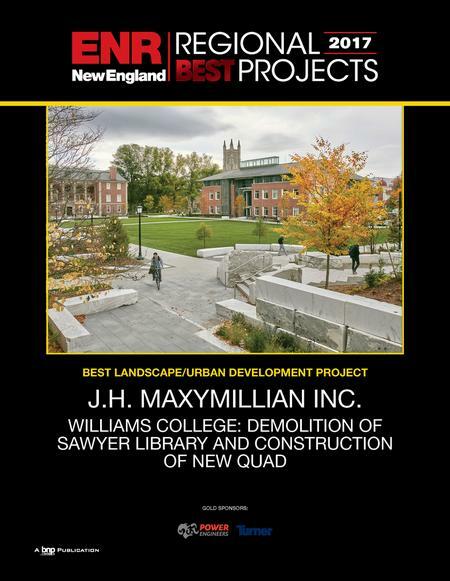 We are proud to receive the Best Project Award in the category of Landscape/Urban Development for our Williams College: Demolition of Sawyer Library and Construction of New Quad, located in Williamstown, Mass. Learn more and see the other winners here.